The San Jos� Peace and Justice Center and the Justice Studies Program at San Jos� State University held a free workshop to assist undocumented youths in filling out the complex applications for Deferred Action for Childhood Arrivals (DACA). For more than four hours students in the Justice Studies Program at San Jos� State University (SJSU) filled out forms for young undocumented immigrants applying for Deferred Action for Childhood Arrivals (DACA) at the San Jos� Peace and Justice Center. They diligently typed information from applicants into laptop computers and printed the filled forms on the spot. A lawyer from the Asian Law Alliance checked the filled forms for completeness. The first �form fill-in day� was held on November 23, 2013 and, given its success, more are planned. This free service would have cost prospective applicants $500-600 elsewhere, even from other non-profit community service agencies. This does not include the $465 application fee charged by the U.S. Customs and Immigration Service (USCIS) for which there are no waivers. The idea began in the summer when SJSU Assistant Professor William Armaline of the Department of Justice Studies was looking for collaborative projects with the San Jos� Peace and Justice Center (SJPJC). Michelle Cordova, president of SJPJC, and Shelby Minister, its coordinator, proposed a project to promote DACA applications and assist applicants with the complex documentation required. Of all the proposals, the largest number of Justice Studies students volunteered for the DACA project. Young undocumented immigrants, some of whom crossed the border on the shoulders of their parents, have grown up in the United States and known no other life. Many have succeeded in getting a higher education only to find their futures blocked by not having legal status to work in this country and living in constant fear of deportation. Repeated attempts to introduce and pass the DREAM (Development, Relief, and Education for Alien Minors) Act in Congress during 2001�2011 were aimed at providing relief to undocumented young people present in the United States through no action of their own. While some of their parents consciously entered the country without documents because of economic necessity or to rejoin family members already here, others came legally but were unable to leave before their visas expired. With Congress failing to pass a DREAM Act, President Barack Obama announced on June 15, 2012 the new DACA policy for undocumented immigrants who were then under the age of 31 and generally met the eligibility criteria under the proposed Federal DREAM Act. DACA would be one provision of a general policy of prosecutorial discretion under which the Department of Homeland Security would ostensibly focus its deportation efforts on those who have committed serious or violent crimes. DACA would grant temporary legal status and work permits to successful applicants. 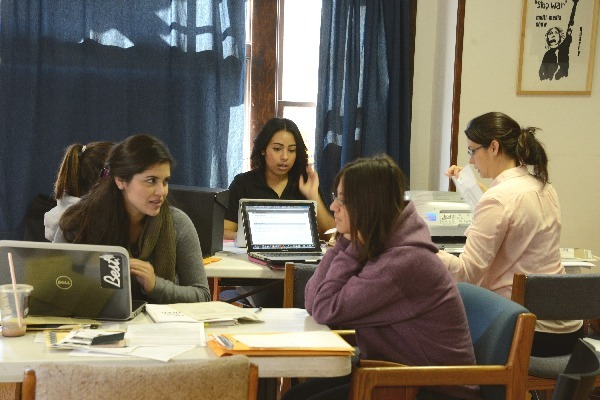 Students in the Justice Studies Program at San Jos� State University fill out electronic forms for DACA applicants at the San Jos� Peace and Justice Center during a free workshop on November 23, 2013.